I’m laden down with my camera bag, an umbrella and a take-away cup of tea from Costa. I push at the swing doors and nothing happens. I turn and give them a shove with my bum and they grant access. 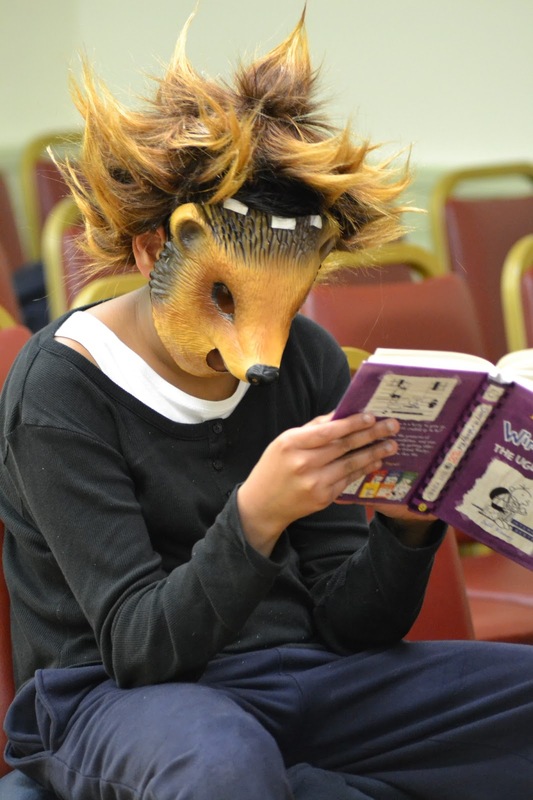 I’m in the Town Hall, in the room where I donate a pint of blood every quarter; today, however, it’s been turned in to a small theatre for tonight’s performance of Fantastic Mr Fox. I see Miss J in the thick of it, looking her usual serene and calm self. I see and hear twenty-plus children chatting and playing on their phones. None of them appear to paying attention to Miss J. She happens to look in my direction and smiles. I find a quiet corner for my bag and coat and then sip my too-hot tea. I take my camera out, put the strap around my neck and fit the big lens. From my corner, I spy out the lie of the land, work out which children have which part and decide where I’ll stand or sit. I look at my watch; it 2.15 pm. I have a clear run of one hour and fifteen minutes. Alexa, of Trimming the Sails, invites people to share a moment with her around this date of each month. Nothing fancy, just a few well chosen words, or a photo, or a scrapbook page. And it's a really cool photo that you used with this post as well. The photo is great Ruth, hope you enjoyed the play. What a splendid photo you've taken for your moment! I could understand so perfectly about the door and the clarity of your description made me smile. Your photographic skills are clearly much in demand and very gratefully welcomed. Delighted to read another moment from your life and thank-you so much for linking up :). What a wonderful description Ruth. Beautiful. What a fun challenge to photograph a play! Great photo Ruth…you really are getting around with that camera! I don't even know how I ended up here, but I thought this post was good. I do not know who you are but certainly you are going to a famous blogger if you are not already 😉 Cheers! [url=http://www.tanzhesi.cn/blog/uhome/upload/space.php?uid=71002&do=blog&id=484434]beats by dre cheap[/url] like the specific comedian manual film frame while it endures. the particular actual testimonials for the flicks are almost always yet returning dominant, at the same time entire full investments returning, to begin with even a sense progressed the conclude inside twelve months we are all going to recall Skipper the united states: most of the First Avenger as a result Marvel's real error in judgement. clients properly whine with reference to Sibel and the companies super hero video clips. What a great story and fantastic picture to accompany it! Ah I recognise those stiff doors and dealing with them however one must. Lovely moment and fun photo too.